This list is for participants in the 2013 Thrifty Secret Santa gift exchange. More details can be found in the Official Thrifty Secret Santa Thread. How much do you like: Ameritrash, Eurogames, Family, Party, War, or Strategy games? This list will be used by your Thrifty Santa to select games for you. The more detail you add, the better for everyone. After you have received gifts, you may add them here: 2013 Thrifty Santa Look What I Got! List. These don't come up often, but I've seen a few over the years and they both have modern reprints. I want to play the originals... condition isn't important at all.. or even completeness really. I can pnp anything missing, just for fun. Really I'm not very picky. I'd be very pleased with any game from a hobby oriented publisher from the last 10 years I don't already own. I'll play anything once and like to try new things. I'll add some ideas that are found more frequently when I have a chance. Resource/hand management an building are well received in our home. As is route building and pick up and delivery type games. Player interaction (especially with kids games) is a good indicator... but not interaction as in conflict. No negotiation. Not a lot of direct conflict unless the theme makes it really fun. For example my wife would rather play King of Tokyo than a brutal euro game with super tight resources where denial stings like a dagger. Euros, for sure. Card games. Games with pretty bits. Ameritrash. It depends: a tactical luckfest, no thanks. But anything thematic. that rewards planning and strategy is good. War games. Not unless it's your scarred up old copy of BattleLore that you don't need with the reprint coming. Euro-war is ok.
Strategy games. Strategy is great but needs a purpose... Not too keen on abstracts. Gotta have some theme. My youngest still collects Pokemon cards. I collect dice and bits... like serious component drool. Indented dice that are not yellow will be well received. Airlines Europe - Wow, a combination of Acquire and Ticket to Ride...I love it. It's become a go-to game. San Juan - Got hooked on this via the iPad, now we play the card version a bunch too. Excellent weight game. Small tradeoffs every minute, and the game is quick enough to play a few times in a sitting. A new favorite. Sushi Go! - Very light card game, a mini version of 7 Wonders (kind of). Adorable graphics. Everyone we play this with loves it. Lords of Waterdeep - Still playing this one. Love the randomness of which buildings come out, which lords are in play, etc. And the theme. And the special Dndeeples. Fantastiqa - Enjoying the whimsical fantasy nature of this one. It is very easy to learn, but there's more strategy here than I initially thought. The Adventurers: The Pyramid of Horus - Adore it. The spooky mummy theme, the push your luck mechanic (falling blocks! ), the tactile bits - great game. Playing a buddies' copy, I need to own this. This game was made for me! 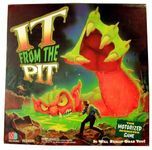 It from the Pit - My 'thrifting for you' entry this year. I have no idea if the game itself is any good at all, I'm just in love with the look of the thing. A giant monster reaching out of a pit of ooze...what's not to love? The Dwarf King - Fun silly card game. Great theme, feels very similar to Dragonmaster. Lords of Vegas - Kingsburg goes to Vegas! Whee! Escape from Colditz - I was so excited this past year to find Escape from Colditz Castle, only to be so disappointed in realizing it wasn't the game I wanted. *This* is the game I'm after. Looks great. I'll probably never run across it though. Lol. Glen More - Played this a couple of years ago and really enjoyed it. Then couldn't find a copy. All my trades fall through. It's fell down my list a bit as a result, but now our daughter is studying in Edinburgh, so Scotland goes back up the list! Fairy Tale - Had this at one time and gifted it away, the anime artwork just turned my wife off. But some of the newer PnP versions look like they might be a better fit for us. And we love 7 Wonders/Sushi Go. Would like to own this one again and give it a spin! Bears! - Simple filler games, especially with dice, win. This one has tempted me, but I've never pulled the trigger on getting it. And the theme - we do like to hike & camp. Theme - light monsters & scifi win the day. Nothing too dark. Death Angel is about as icky as I'd go. Mix scifi into alternate history? sounds great. Monsters invading London? I'm there. Building/Evolving - Let's build a simple empire or evolve a mutant dinosaur today! Push Your Luck - Quick, easy, lots of shouting and fun. Plays well solo or with two players. Most of the time it's my wife and me playing, or it's just me. Great bits. Yep, I'm a sucker for cool bits and pieces. Probably a combo of worker placement and dice. Or light city building. Definitely push your luck. A bit of sci-fi or monsters thrown in. Nope! Our daughter is grown up and off to college. No kids around the house. But we still play things like Mice and Mystics or Heimlich & Co.. I am the King of the Thrifters! I own huuuuuge tracts of games! But do not fear me. There are many games that I have not enjoyed yet. So many. Games I'm blissfully unaware of. But you know them. What's your favorite? Do I have it? Should I be playing it? I love discovering games that I've missed over the years (perfect example - I'd never played San Juan before this year). So no worries, nothing to fear here! You've got an easy assignment with me - I'm a happy guy, easy to please! The artwork in Square Mile is fantastic. As is Bob Pepper's work in Dragonmaster. The cover of Lost Treasure just screams 'adventure' to me. I love great art in a game. If it's a creepy, spooky game, I probably want to play it. The Haunted Mansion is my favorite ride at Disneyland. Always has been. Halloween is the best holiday by far. Monster and ghost movies - I'm there. Especially something like Abbott & Costello Meet Frankenstein. Here's my wishlist from 2012. Our family is going on vacation to Edinburgh and London this winter. We're excited about that. I've taken up running this year and have gone gluten-free and lactose-free, what a difference. I'm in much better shape than I've been in years, but it means I can't indulge in holiday cookies! At least I can thrift new workout clothes every time I go down a size. Lol. That change in diet means our home cooking has changed drastically as well. Much more towards the Paleo end of the diet. We still cook a lot, but it's mostly meat and fresh vegetables. I've been watching more and more British TV as of late - can't wait for the Doctor Who specials in a few weeks, and I think I'm the only person I know that knows who Peter Capaldi is (or Malcolm Tucker). Netflix has been fantastic for catching British TV - I'm just finishing up Peep Show now. We listen to a lot of podcasts on our commute, our favorites are Spilled Milk, Film Sack, Stuff You Missed In History Class, TED Talks, Radio Free Skaro (when my wife isn't riding along), How Much Do We Love, and the NPR Pop Culture Happy Hour. And of course gaming podcasts (again, when my wife isn't in the car) - especially The Dice Tower, Secret Cabal, Flip the Table, and Garrett's Games & Geekiness. Not a big sports fan, I just casually follow the niners and the sharks. Except when they're winning a bunch. Then I'm a happy fair-weather fan! Big Bruce fan. Always have been. And Tom Petty. And ELO/Jeff Lynne. And apparently Lou Reed - didn't know that until a week or two ago, when we locked onto that Pandora station at work. Great stuff. I love this exchange. Opening the thrifty santa presents is a highlight of Christmas morning around here! Thanks in advance Santa! * No Thanks! I don't have it! But Tom and Eric claim it's a top ten must have game. Hmmmm. * Dutch Blitz I've only ever found a partial set of cards. It would be terrific to have a complete set. * Take it Easy! Ditto here, have only found a parts copy to date. A complete game would prepare me for convention play. * Any of the Mystery Rummy series - the only one I've ever found is Wyatt Earp. This means there are likely many more common, great games I'm missing out on. I wonder what they are? **I loved the Doctor Who 50th anniversary specials that just aired. Fantastic stuff! Boy do I want these two games now. I may be learning more about pnp early next year! Here is a short rundown on what I enjoy in gaming. I love Ameritrash. I dont enjoy Euro's. Family games are good. Party games...not so much. War games are ok if they are in the fantasy realm. I play games with my 13 and 7 year old nieces just about every Friday. Hmmm..I also take enjoyment in all things Dinosaur,Robot,video game related, and aliens! I also enjoy horror books and movies. Im a kid of the cult when it comes to horror and enjoy 50's pulp and hard case crime. Batik Jr., Monza, Animal upon Animal, other HABA - These are great to play with my 4 year old daughter. Heroscape Master Set: Rise of the Valkyrie - I have the terrain, and am missing the minis and glyphs. Qwirkle Cubes - Not as common as the original, but we have the original and like it, so this seems like the next step. If you can't see from above, I play games mostly with my family. Therefore the games need to be family friendly. I have 3 daughters (ages 13, 10, 4) and 2 sons (ages 8, 3), so games that play well with kids (but won't bore me to death) are also good. Small/easily portable games are good. I've got over 1000 games already, so storage is always something to think about (but don't let that rule out awesome games that are huge). FILLER - Due to the kids, sometimes we have only enough time to get in a filler, so I'd love to increase the games I own in this category. I know I already have many games Santa (too many if you ask my wife), so I know it's going to be difficult. I'm not picky, and I'm willing to try just about anything, so don't worry if you can't find anything on this list. Basically, I like things I can play with my family and things I can play with my game group, so that leaves a pretty large area of possibilities. Ameritrash, Eurogames, Family, Party, War, or Strategy games? I like games from all categories, however if I were to say which one I liked least, it'd be war games. Mostly just because I haven't ever taken the time to play a several hour/day long session. Plus I don't know who I'd play that with. That said, I do like games with a war theme, like Memoir '44, but that's not really a war game. I like the randomness that comes from some ameritrash, and the strategy involved in outperforming your opponents in euro's. As I've said before, I play games with my family, so that's definitely up there. I am not the biggest player of party games though. Occasionally I do play them when I get together with other extended family who are not "gamers"... I probably have enough abstract strategy games to keep me busy, seeing as those don't get played very often, however it's not because I don't like them, so if something is found that Santa thinks I'll like, feel free to send it along. Dear Thrifty Secret Santa: thank you for your patience and for your anticipated generosity! You get the idea. I'm actually not as picky as I might seem -- just thankful to be here! Definitely look at my wishlist for other ideas. For example, expansions to games I already own or related games I haven't thought of yet. Wooden components! I especially like well-balanced games, games that have obviously been thoroughly play-tested. I also like deeper strategy. Even though I'm into Euros, I do really like theme. Oh -- I like co-ops too. What is my favorite style of game? Euros, for sure. Also, train games and strategy games. But a theme-y Euro would be awesome. Eurogames: love 'em, love 'em, love 'em -- it's where it's at, baby! Do I play games with children? If so, what ages? Yes, I play with children of varying ages -- but not frequently. Anything else I enjoy or think would help Santa find the right gift for me. I collect Diplomacy. I love Diplomacy. So if you can't find anything else, Diplomacy is always a good idea. I'll take any and all versions -- even ones I already own. And my top rated games Combat Commander and Mr. Jack. 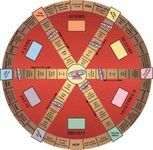 Hold'em-opoly or Trivial Pursuit: Bet You Know It - for the mini chips. I got some great clay chips from TSS last year, but always on the look out for another set of smaller chips that can be added to my "traveling" game bag. Odin's Ravens - a long shot, but I got burned on the Kickstarter for this one and I've never been successful acquiring it in a math trade. While I enjoy war games tremendously, my opportunity to play these are even more limited than other games, so unless it has a solo component, I would have to pass. No Zombies or dungeon crawlers, please! I don't really have a favorite style. Our game group plays a wide variety and for the most part, I enjoy most of them. Party games are a "no". I have a number of them, but it's the kids (youngest is 18) who play them, not me. Nope, not really (my youngest is 18 and no grandkids yet). Gigamic - I have a nice Gigamic wooden abstract collection going and would like to keep growing it. How much do I like: Ameritrash, Eurogames, Family, Party, War, or Strategy games? I really like Ameritrash, Euros and Strategy Games (especially abstract strategy). I have never played a War game, but am open to it. I am not that into Party games (though we do like CAH). In addition to currently enjoying "Family" games, we have a baby on the way and are looking to have games ready to teach when he/she gets old enough. We play the occasional game with my kids (16 and 12): Apples to Apples, Battleball, Buffy, Blokus, Can't Stop, Get Bit!, Guillotine...well you get the idea. My WISHLIST is compulsively updated, so that is a good place to start. I like to think that I enjoy a wide range of games and am willing to always try new ones, so do not let my wishlist limit you. 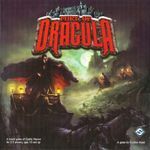 I also am always on the lookout for parts as I really enjoy PnP games, so feel free to check out my WANT PARTS list (also compulsively updated). It has been an interesting year, full of up and downs. The ups have definitely been centered around gaming with my family and friends and being part of this wonderfully generous thrifting community. I have done my best to pay good deeds forward and am looking forward to continuing to do more in the new year. My collection may seem very large, but keep in mind over 100 of the games in my collection are for sell/trade. Still I do have quite a number of games, but don't be nervous, there are many many more that I would like to provide a home for and I am sure you will be able to find something just right. Last year I got a game I had never heard of, it was Magic Hill and I love it! There is lots of great info about me on my profile. Be sure to check it out, ask questions, and even use your spy on the inside (my hubby). I have confidence in you. I am a true believer in you and the magic of Thriftmas. My favorite themes include fantasy, Egyptian, Arabian, archaeology, pirates, medieval, and islands. YES, I have a 10-year old son with Asperger's! He loves games, but has trouble staying focused so shorter games or games with quick turns are best. He doesn't care for speed games, or strategy games, but does like dexterity and dice games. In addition to family game time we often start our game night sessions with a game that he can play before sending him to bed. We are a family of Playmobil enthusiasts, I personally have been collecting Playmobil since I was a kid. Loose Playmobil bits in good condition found while thrifting (especially animals or figures who are not modern in theme) would be gladly welcomed. Also spare bits for those few games I've acquired that are missing them would be awesome. I am currently a stay-at-home mom. Before I was a mom, I worked as a graphic designer and earned my degree in Visual Art. I really appreciate good-looking games because of this background. I used to love playing epic games that would last all weekend, but life is just too full these days for games like that. Now I prefer to play shorter games. The sweet spot for me, and my family and friends are games that are around 1-2 hours. I also like very quick filler games that are 30-45 minutes (or even shorter). P.S. My hubby (and probably most everyone in my family) will be getting me games for Christmas. Mostly these will be new/newer games, but it is in the realm of possibility that some older games might be purchased. It would be wise for my Secret Santa to communicate with my husband to avoid any unfortunate duplication. Any Risk set I don't already own. Pretty much anything from my wish/want list. Not sure if I have a favorite style, if the game is interesting, we will play it. If its easy to learn and plays well for 2-3 people will probably be the best. We like card games, dice (love dice), game play less than 90 minutes. Do not like War games. Never really have more than 3 to play for party games. Other than that, not really restricted in the type of game we play. If its interesting and fun it will get played. Yes, my son is 16..
A nice wood planchette for my Ouija boards to put on display. I did thrift the classic blue/green boxed edition of Acquire, but traded it away in a math trade. The heart wants what the heart wants. I've lusted for this 1999 edition since first sight of the oversized board and beautiful colored buildings. Right now I'm really enjoying Lords of Waterdeep, Alhambra, and my latest Kickstarter Karesansui as well as my newest purchase, Yedo. My favorite games are Euros, especially worker placement. I love word games, but have many more of them than word playing partners. I like strategy games with a theme, Balloon Cup yes, Chess, no. War Games, children's games: never, ever. Ameritrash can be good, but I'm not a zombie fan. Ditto coop games with villains. Or any "social" game where you're trying to guess who's a this or that. If a game on my Want List is marked pre-ordered, it means I'll be picking it up at the BGG.con. Math Trade or Virtual Flea. When in town I go to the GWO twice a week. My other passion is running my Game Rescue Mission, supplying free parts to all the needy boys and girls. I'm retired and theoretically I have time for this. I recently found fifteen of those faux leather slipcase covers for National Geographics. What a perfect thing for alphabetizing so many bits! But as I close in on supporting 150 games, I really could use more...perhaps Santa could check Craigslists under free or books...some folks are still trying to sell these, but more enlightened folks are giving them away. Any number would be welcome. Not complete -- but it's getting there...relax! - Liar's Dice -- usually caps the night, mainly to yell, "PACIFICO!" 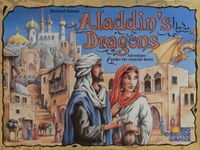 - Aladdin's Dragons -- Keydom; a reach most likely but it looks so good! - HeroQuest figures/minis -- I thrifted one that basically had 95% of the furniture/cards and none of the minis. - Almost anything really. I'm moreso in the market to diversify my collection instead of limit it. So new (to me) game mechanics is always a plus! Seems like co-op games in my group get the short of the stick, but I kind of like them. Theme doesn't matter to me as long as the game mechanics are sound. I'm also a sucker for anything done by big name designers. See above. Game length is another thing that I care about. I already have a few games that take 2+ hours so I'm not really looking into 120+ minute games. I like a solid 45-75 minute games, b/c my groups are slow. Also, NO 2-player games...they NEVER reach the table. Eurogames -- love them, a lot! Family -- no kiddie games; but light-strategy is always fun. - No, not at all. I game with mostly 20+ year olds. Complexity is no issue either. No 2-player games! - Well, I know my wants probably don't encompass the common finds but that's ok -- I like the surprise. Even if you don't get me something(s) on my want list, I won't mind. It's there moreso as a guide. - USE my collection, for trade, and previously owned sections -- TRUST me, it will be VERY helpful. I update those regularly to keep a fairly accurate account on what I have and what I like/don't like. - I wouldn't use my wishlist/wantlist b/c I rarely update those. I do want those games, but obviously most are not priority. HEY LOOK I FINISHED THIS!!! Mini's and Figures for Heroquest & Descent style games so I can add to the Monster data base something new for my 4 year old and I to fight against. Seriously though...these are just some games I have seen, NOT what I would expect. I have a certain soft spot and nostalgic warm fuzzy feeling for all things 80's. games from then were such a HUGE part of my life that I cannot get enough of them. (4) What is your favorite style of game? I like lots of bits and lots of fun! Also, games with little to no components but AWESOME gameplay! Seriously, I just like games. I will play all kinds...even just to get a feel for the mechanics. YAY for GAMES! (5) How much do you like: Ameritrash, Eurogames, Family, Party, War, or Strategy games? Ameritrash: When I bought and played games growing up it was these. A thousand army pieces on the boards...A dungeon full of orcs....I have a softspot for sure with Ameritrash and it's never going away. Family: Every night when I get home from work my kids and I break open the board games and play until bedtime. So I am placing this category up here for that reason. We play a TON of games...some stick around and we play them for months. Others that are not as awesome end up getting donated to schools, churches and other kids in the neighborhood. GAMES SHOULD BE PLAYED! Strategy/War: I'm kinda lobbing these two into the same category. I love these type of games but can never, ever get anyone to play them with me. The first board games I ever played were the old Avalon Hill games. Unfortunately most people seem to prefer plastic over cardboard these days. Party: I'm too old to party anymore. Plus if I actually DO have a hand full of friends come over we would rather just listen to records and grill dead animals for dinner. (6) Do you play games with children? If so, what ages? I play games with kids ALL THE TIME! My daughter is 10 and she can grasp pretty much anything I throw at her. She comes to the twice a month game group I got to and plays games there till 1am. I mostly play with my son who is 4. He also can play just about anything that's not geared towards someone waaaay older than him. It's crazy how fast you can see kids grasp ideas and concepts in games once they have been playing them for a couple years. (7) Anything else you enjoy or think would help Santa find the right gift for you. There is no right or wrong. Seriously. Don't worry about getting 'the right thing'. We love playing so many different games it would be impossible to not be a successful TS. My kids are excited (once again) to be a part of this. They love sending out a box more just as much as the one we receive. Belfort - Theme, mechanics, and artwork. My favorite game for over a year now. There are better games, maybe, but I just enjoy this one more than any other. Pandemic - Great thematic co-op. Also a very pimpable game which is a great quality. Kings of Air and Steam - Fun pick up and deliver game with programmed movement. Cool bits and fun game. 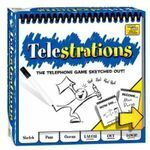 Telestrations - Usually not huge on party games, but this one looks like a good one. Dixit (But you just said...) - ok, so this one looks good too. 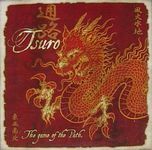 Tsuro - A nice elegant filler that I've played and thoroughly enjoyed a few times. He also loves anything Spongebob, LEGOs, Lincoln Logs, and puzzles. Android:Netrunner - brings back memories from the origional and trying to get my daughter (9) to play. Power Grid/Wealth of Nations - I love the economic malipulation in these games. RISK Legacy - played through this games once before and now have a new play group to introduce it to. Alien Frontiers - I love the mechanic of input randomness (see below for my defination). I want to try all of the Kosmos two-player series, i am pretty well on my way. Robbo Rally would be one of my Grail finds. "input randomness" where you don't know what you have to work with each turn. I really can't say, i think i like them all...except party games. Like i said above i like them all except party games. i have a daughter (9) and a son (7) both like games thankfully. daughter - netrunner, looping louie, hey thats my fish, lost cities. son - knights of charlemagne,looping louie, hey thats my fish, Mind Twist. This will be my first time in the thrifty santa and am just looking forward to sharing the fun of games. Euro or ameritrash, doesn't matter to me. I like them both. I'm really easy to please. Just because I listed the big end games above doesn't mean that's all I want. Only 2 things I'm not interested in: card games (except for the Mystery Rummy series that I don't have), and abstracts (except for Gigamics that I don't have in the cool Fundex packaging). Secret Santa has always been fun, and I've never been disappointed with what I've been gifted. So let's have fun! X-Wing - I really like this game and how it can be customized by using the different ships for different missions. I am also a fan of the Wings of War series. Zombicide I enjoy the theme (who doesn't love zombies) and the endless number of scenarios to keep it fresh. Pandemic A really fun co-op game. I also enjoy Castle Panic in the co-op genre. The Resistance An awesome easy to learn group game. Deduction/bluffing games are great. Hive A great little 2 player with tons of strategy. Ascension I play the phone app for this every day with friends. Great deck building game. Hive or Hive Carbon I only the the phone app for this and would love to have a physical copy. Wings of War: Burning Drachens I have most of the other core sets. Also any and all plane minis. X-Wing I've just started playing this and would love some of the other ships as I just have one core set. Merchant of Venus I love old Avalon Hill bookshelf titles although with a 2 year old, the war games are not going to make it to the table very often. Heroscape also never found any of these. I'd love a playable copy of one of the Master sets. Ikusa Thought this was fun back in the day but I've never run across a copy. Kingdom Builder I've seen this on the list a lot from the B&N clearance No such luck for me. Goldbrau or Glen More or Viticulture I enjoy having a drink, so why not have a drink and play a game about brewing, distilling, or winemaking?! Strategy, games with strong themes that aren't just pasted on, nice looking components, games that don't take up a lot of space (I will make an exception obviously for stuff on my want list! ), games that take under 2 hours, games that do not not take forever to learn, games that age good with 2-3 as that is my most common gaming group. Resource management, area control, worker placement, deck building, dice, really anything but abstracts or party games. This is my first time trying this gift exchange. Sounds like fun, I hope I can spread some joy. I am pretty easy. I like a lot of different types of games. Old and new, easy and harder, dice, cards. You're ruining one of the best songs ever!!! We have been supremely blessed year after year in the Thrifty Santa. We are really looking forward to giving a haul to someone this year after some very nice finds. I am mostly an equal opportunity gamer we really are happy with anything. That being said I'll try to make my list realistic but I'll also have some of my personal grails just in case. 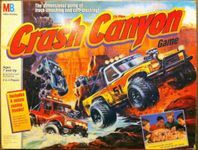 Crash Canyon This is my current mini grail. By mini I'm not referring to the size of the box but to the desire I currently have for it. I really do not expect it in any way but if my Santa just happens to have it hiding under their bed - I have a shelf prepared and two kids ready to play. Aquaretto We're huge fans of Zooloretto, and my daughter told me to put this on the list. Coloretto Another my daughter asked me to put on the list. Mystery Express I'm a huge fan of Days of Wonder - I think this is one of the few we don't have yet. Ticket to Ride: Europe We really enjoy T2R Americas - My other daughter told me to put this on the list. Zaxxon I have a thing for the old arcade themed board games - I've managed to find a few of these over the years but am still looking for this one. Loopin' Louie Still regretting not getting this the 1 time I saw it - in my defense I was still new to thrifting and on a high after finding Mexica and Wasabi on the same day. Catan Or any of the variants. I now have a French copy and an incomplete English edition but I would really like a complete copy - I'll try to list the specific bits I need just in case Santa has a parts copy. Any of the American Heritage Games with Dogfight, Broadside, and Hit the Beach looking the most interesting. Back Off! Buzzard Just saw someone snagged this last week - just looks like ridiculous amount of fun, the kids would love it and I'd pull it out with friends and beer. Fearsome Floors Not that common but have almost paid retail for a couple of times. Missing parts to games - I am very aware of the Spare Parts list - I've just been very slack in making folks aware/shipping/checking for parts for others as such I don't feel right asking for parts until I've helped out a bit more first. But of particular interest are bits for It from the Pit and a goblin Fanatic for Talisman 3rd ed. As always I'll populate my want list, want in trade list as I think of things or see things in thr thrift lists that are interesting. I can't really say what my favorite type of game is, each has its place in our household. I really dig flashy games with cool bits. For some reason right now I'm groovin' on what I term "toy games" where a toy like object is part of the game itself Tornado Rex, Fireball Island, Slime Monster Game being perfect examples of these. Games that have a play time of 2 hours or less are perfect, as much as I would love sitting around all Saturday playing TI3 I'm a single dad and that 1 weekend a month I have to myself I'm working on my house or trying to do something to increase my chances of being a non-single dad. Normally I would say fantasy based but I've thrifted most all of the ones that piqued my interest and with the Myth KS coming along I think I'm good here. I can't really place any of the categories as I'll try most anything. Party games fall flat in my house and I really have enough wargames right now. I have two lovely daughters who are 7 and 10. We play together. My youngest especially is super into Pokemon cards right now - she doesn't play just likes trading w/ her friends. My oldest is too but mainly just because her sister is. bootleg Grateful Dead on vinyl - I have every studio/official release except "Built to Last" so am always hoping to find Dead vinyl boots in the thrifts - Hey it happened once: still braggin' about it! 2 Heimlich & Co is a game I would love to get my hands on! Also, Escape from Colditz is a game I used to play as a kid. 3 I enjoy games that scale well and that my wife and daughter will enjoy. I enjoy interaction without backstabbing and anything that might be considered unique...like Mord Im Arosa. 4 I am a fan of Euros though I see myself leaning toward hybrid games..Eclipse etc. 6 I run family games nights at local elementary schools so I often am teaching and playing with kids. Check out my wishlist and you will see a wide range of games. Honestly I am not fussy...I enjoy trying new games. I hope my Santa surprises me! I love the Thrifty Secret Santa Exchange. This is the fourth I've participated in and it's just great fun. Race for the Galaxy - I'll play this any chance I get. It's about the unfolding tableau for me. The Castles of Burgundy - I like the use of dice in this and appreciate the tactical element they bring to the game. Elder Sign - An Arkham Horror-like story that unfolds in a fraction of the time? Sign me up. Blokus - I started playing this with my kids recently. It's a game all of us can play together and the kids all like. Insta-win in my book. Gunslinger, Magic Realm, Assault on Hoth: The Empire Strikes Back, Merchant of Venus, Infinity,Fireball Island, The Sword and the Stars, King of Tokyo and of course Aliens. Science Fiction? Fantasy? Minis? All pretty safe bets. I'm always open to any euro (more or less recent) I haven't played or might make a fun gift. I also like old RPG stuff of most any kind, just for reading mostly. I need some parts for Star Wars: Epic Duels I've had a hard time finding. 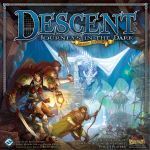 Check my BGG wish list and collection to see more details - or just have an Elf message me with questions. Scalabilty. I really like owning games that play from 1-5+. Theme. It's like gravy: theme just makes everything a little bit more delicious. Any storng and well implemented theme is tops in my book. But as a card carrying Geek, I most enjoy science fiction and fantasy. Chaos/Randomness/whatever. I like having to improvise a solution when dealt something random in a game. Not all the time, but a good dose of something random now and then is great. I heart event cards! Creation. I like building things in games. Cities, farms, space ships, huts - whatever. I like the sense of something taking shape as the game progresses. Other things I like are asymmetric games and games with variable player powers. That's a difficult question as I enjoy games from a variety of styles. Not as excited about party games, abstracts and word games. I loves me my classic Ameritrash, but enjoy and play far more eurogames. I have two six year old twin boys, and an eleven year old daughter I regularly play games with. Lots of things make me happy. Non-game geeky things are appreciated as well - it doesn't have to be just games. Thrifty Secret Santa is best when folks get creative and have fun. So have fun! My collection is large and fills much of the house so, in general, I would appreciate just a few gifts and nothing in a big box. I play games with my 9 year old daughter and my 5 year old son as well as my regular gaming group on Saturdays. Lately my daughter and I have been playing Pokemon and she's started building decks. My son loves everything Star Wars as well as superheroes, knights and ninjas. I don't really play war games, party games or abstracts. I like Ameritrash, Euros, thematic games, deck-builders, old ccgs and oddities (loved finding Smile Squad). I've just been introduced to the mini versions of Ravensburger games, specifically Mini FITS which is a huge hit with me and the kids. Mini Make 'n' Break now looks very interesting. Also, since my son gets upset when he loses, I'm always on the lookout for more Family Pastime cooperative games (I think they're all cooperative). My grail is Snowstorm. Any LEGO game would be very welcome. We're into re-purposing and creating house rules, so we don't really care about the rating the game might have on BGG. This will be my first foray into Thrifty Santa! Yes, these days it is mostly my grand kids and the ones that are up to playing games are 5 and 3 (with 3 more not ready for games yet)! Take a gander at my wish list and want in trade lists, bits, if you have a gift card for eating establishments you don't really care for (as long as they have locations in SE Michigan or Toledo, OH area). Home baked goodies are always nice (no coconut please). Baseball cards pre 1975 (condition not important). And I have updated my wishlist with things that look interesting to provide more ideas of what I might like.. However, I really enjoy Memoir 44 so maybe a light war game would work, and I haven't played many Ameritrash games so feel free to surprise me! I like handmade game pieces and dice trays. Other things I have been looking for recently in the thrifts are, craft supplies, local history books, genealogy books, and Christmas music CD's. I like well made games. Kids games are OK as I have many nieces and nephews...and have never thrifted a Haba Game. Memoir 44, can't get enough. Survive. I know that there have been a bunch of these liquidated at B&N. I am hoping that someone bought it as a gift and the recipient donates it soon. There have been non available at our local B&Ns. And nearly anything I haven't played. I love learning new games! My 'want to play' list is much longer than my wishlist. How much do I like Ameritrash, Eurogames, Family, Party, War, or Strategy games? I prefer wargames, but I'm open to anything except CCGs. Do I play games with children? Yes! My granddaughters (8&9) love games. 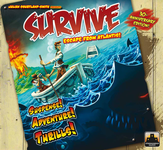 21-11-2013 Update: As my luck holds, I received Survive as the ONLY sucessful trade in the US only Xmas Math Trade. And of course, anything else on my wishlist. Ameritrash - please no zombies! War - I'm not in to war games at all. Nope, not really. The only kids I game with are teenagers who like the same games all the adults play.